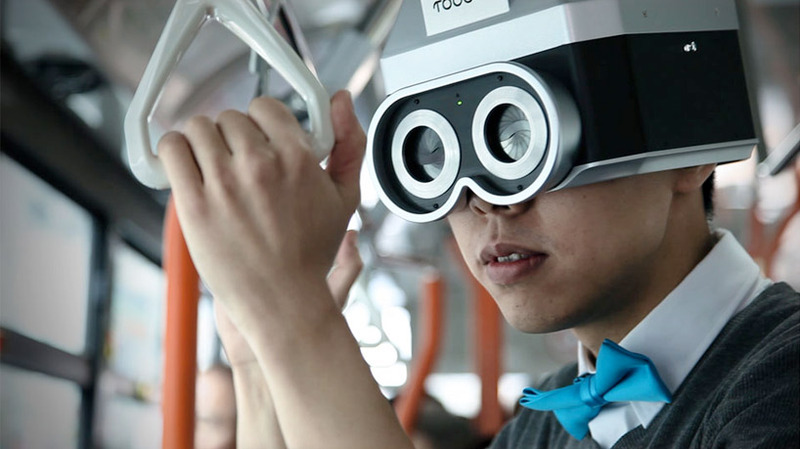 hong kong new media creative eric siu has conceived of a tactile camera known as ‘touchy‘. siu has developed the touch-driven device as a resident artist of the ishikawa oku laboratory at the university of tokyo. the artist’s interest in interactive art, video, kinetics, animation, and video has helped to inform the interactive technological piece which serves as an actualized phenomenological social interaction experiment, dividing its wearer from the world until they receive the touch of another human being. the camera works in such a way that it sits atop the user’s head, blocking out his/her sight until the individual is touched by another person. it is only when the continuous physical contact is maintained between touchy and an outside contact that the human camera may capture an image every ten seconds. eye-hole shutters open and close, giving the wearer back their own vision as the device captures an image of that moment of sight. ‘touchy’ weighs 1.17 kg with a height of 163mm, width of 208mm and depth of 239mm. most wearer’s heads may fit comfortably inside the device within the 60cm circumference provided. the camera captures images in 640 x 480 and 1600 x 1200 dimensions in JPG format with a pixel 2.0 megapixels CMOS sensor. the photographic device offers an LCD monitor of 3.5 inches across portraying 320 x 240 pixels. the battery is 12 volts and lasts through 2 hours of operation time. the creators of ‘touchy’ note that in our technologically driven modern world, it is easy and ‘… common for humans to be separated into social bubbles, to avoid sharing social space and to connect to strangers. however, technologies like internet social networking or the mobile phone loosens social boundaries, hence dehumanizing physical communication. to a certain extent, it generates social anxiety such as the one experienced in the ‘hikikomori’ and ‘otaku’ cultures in japan. touchy criticizes this phenomenon and suggests a solution by transforming the human being into a social device: a camera. the touchy project investigates how such a device improves social life, presupposing that a camera is a known tool for sharing memories, valuable moments, enjoyment, emotions, beauty and so forth‘. wow! great concept, great video!